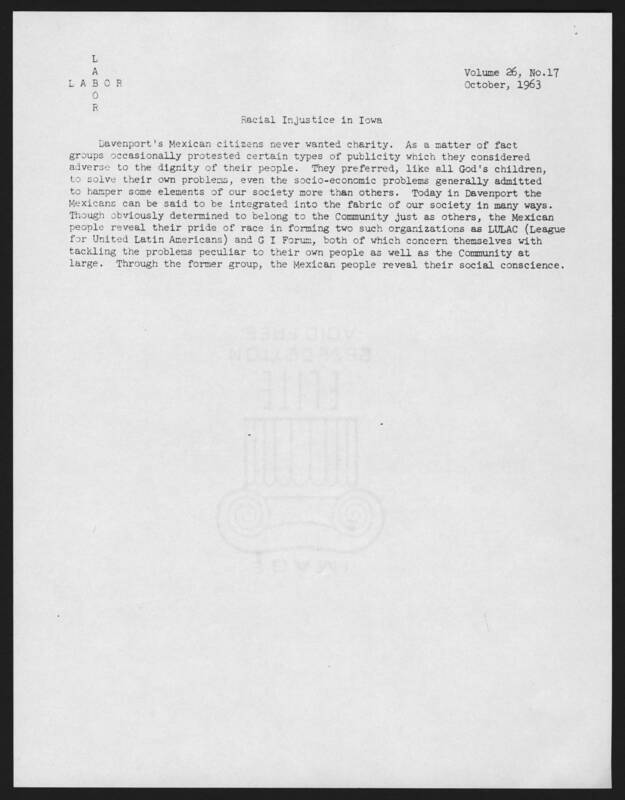 Volume 26, No.17 October, 1963 Racial Injustice in Iowa Davenport's Mexican citizens never wanted charity. As a matter of fact groups occasionally protested certain types of publicity which they considered adverse to the dignity of their people. They preferred, like all God's children, to solve their own problems, even the socio-economic problems generally admitted to hamper some elements of our society more than others. Today in Davenport the Mexicans can be said to be integrated into the fabric our our society in many ways. Though obviously determined to belong to the Community just as others, the Mexican people reveal their pride of race in forming two such organizations as LULAC (League for United Latin Americans) and CI Forum, both of which concern themselves with tackling the problems peculiar to their own people as well as the Community at large. Through the former group, the Mexican people reveal their social conscience.